Replace registration forms that your customers use on your website with Sales Chatbot. Qualify leads on your digital channels and route them directly to the correct sales representatives for follow-up meetings. After collecting all the necessary information for qualified site visitors, the chatbot creates a lead and a contact, assigns an appropriate lead score, and then creates a Pulse or Interaction activity. A sales representative can follow the lead within Pega Sales Automation™ as a potential sales opportunity. To configure your Sales Chatbot, start by adding and configuring the bot based on a Dev Studio example. In the header of Dev Studio, click your application name, and then click Definition. In the Enabled component section, install the Sales Chatbot by clicking Add component. Select the name and version of the component by pressing the Down Arrow key. On the Cases & data tab, add a Sales Chatbot case type with the PegaFW-Work-Conversation-Leadbot implementation class. In the navigation panel of Dev Studio, click Records > Security > Access Group, and then select the SAChatbot access group. In the Application section, change the current values to your application name and version. In the Available roles section, replace the PegaCRM-SFA:SalesOps role with your application role. In the header of Dev Studio, click your application name, and then click Channels and interfaces to add your Sales Chatbot. In the Create new channel Interface section, click Web Chatbot. In the Details section, enter the name of the Sales Chatbot. 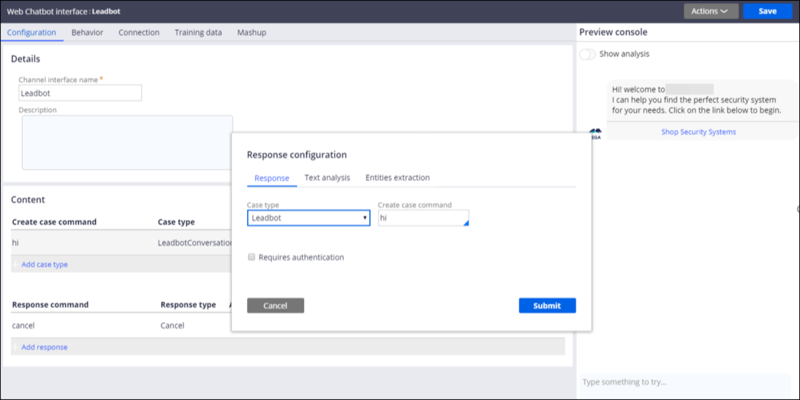 In the Response command section, configure the responses of the Sales Chatbot based on the sample replies. You can use the Leadbot case type as an example. In the navigation panel of Dev Studio, click SysAdmin > Dynamic System Settings, and then select the UseCompactStylesforPDF dynamic system setting. Set the value of the UseCompactStylesforPDF dss to true. After you add and configure your Sales Chatbot, switch to App Studio to enable and configure the settings that are required for the Sales Chatbot to access other Sales Automation features. In the header of Dev Studio, click the Switch Studio menu and then click App Studio. In the navigation panel of App Studio, click Settings > Application Settings. Select Lead Routing and Google Maps & address geo-coding - separate license required from Google check boxes. Add the Google API key. On the Microsoft Exchange tab, in the Microsoft Exchange Integration section, enter the Exchange URL (https://<mail.server>/EWS/Exchange.asmx) and the Exchange version. Complete your Sales Chatbot configuration by enabling lead routing and adding lead routing rules in the Sales Ops portal. In the header of App Studio, click the Switch Studio menu, and then click Dev Studio. In the header of Dev Studio, click Launch web interface, and then click Sales Ops. In the navigation panel of the Sales Ops portal, click Tools > Lead routing. On the Lead routing screen, configure lead routing. For more information, see Configuring lead routing rules in Pega Sales Automation. The Sales Chatbot works only for sales reps with valid Outlook email accounts.